WELCOME! 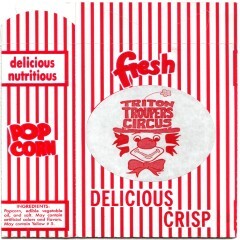 Triton Troupers Circus is an extraordinary show based out of Triton College near Chicago, performing annually since 1972! *1pm show Saturday includes ASL Interpreter provided by the Center for Access and Accommodative Services of Triton College. ASL seating is marked on the bleachers, enter gym thru doors closest to the ticket booth and ask an usher. All shows are wheelchair accessible, all ages, and animal-free. The show is about two hours long including an intermission, and drinks and snacks are sold. Show may include fog and strobes, as well as balloons and confetti. Doors open one hour before show time, so come early for best parking and tickets, and enjoy the pre-show. 2001 N 5th Ave, River Grove IL: YahooMaps  MapQuest  GoogleMaps  RTA. TICKETS are just $6 (CASH ONLY) and can be purchased starting one hour before show time at the ticket booth in the Robert Collins Building. Advance tickets can be purchased at circus rehearsals (gym 7-9pm most Mo/Th) or at the Office of Student Life room B-240 during school hours in the College Center building (on main campus, across street from gym). Triton Troupers Circus is a non-profit effort dedicated to the preservation of the circus arts and to the local community. Triton Troupers Circus features skilled performers in classic circus specialties such as Chairs, Clowning, Double Stunts, Globes, Gymwheel, Juggling, Statues, Teeterboard, Trampoline, Trapeze, Unicycle, Web, Wire, feats of strength and more. Browse the photos, visit Kids Korner, get our newsletter, and come see the show! This website is certified safe for kids of all ages.